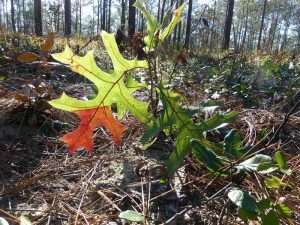 Some species of oaks have a broad range of mature leaf shape and in many the leaves of new shoots are entirely different from the mature leaves. 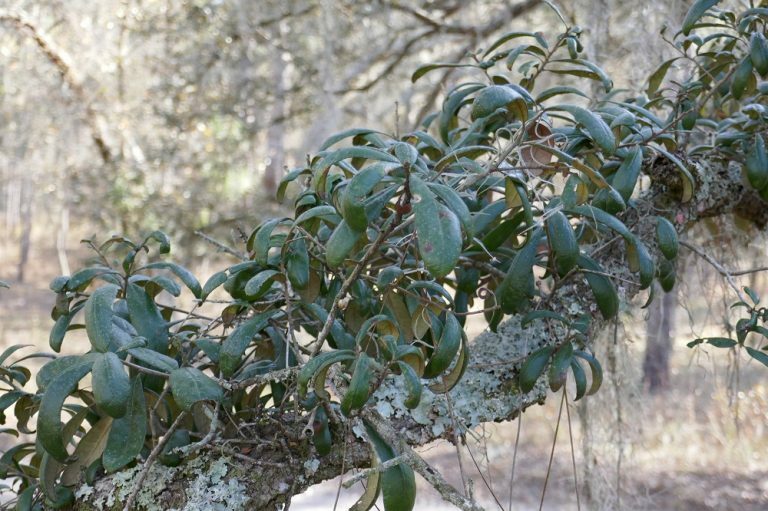 To add to the confusion oaks hybridize between different species growing in close proximity to one another, in turn, producing leaf shapes having characteristics of both parents. These factors make identification to the novice challenging. Identification is most reliable when using leaves from the crown branches. 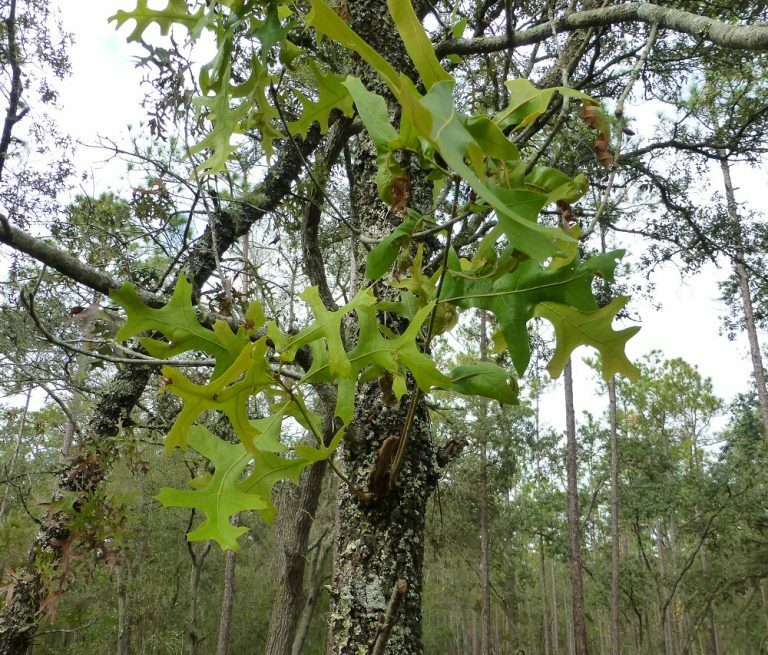 Oaks are monoecious, having male and female flowers on the same plant. Pistillate (female) flowers are inconspicuous, and staminate (male) flowers in some species appear as hanging catkins at the base of emerging growth of the season. 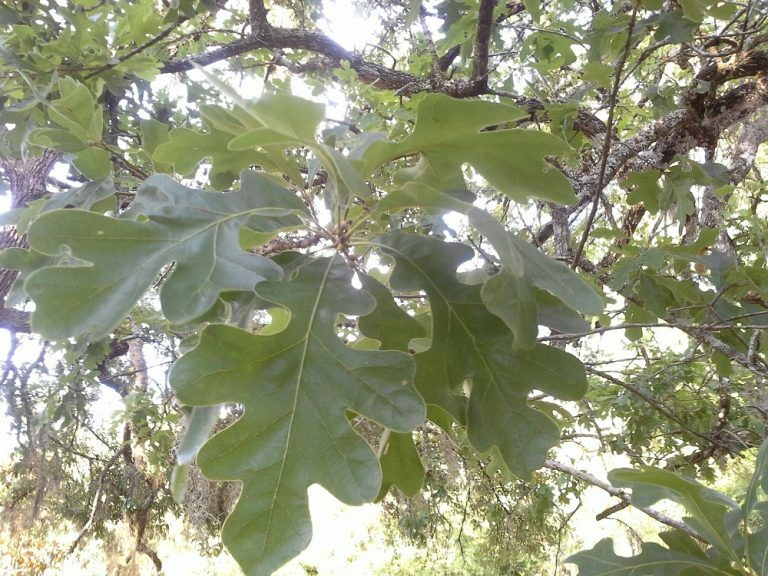 Oaks are divided into two groups: the white and the black (or red). 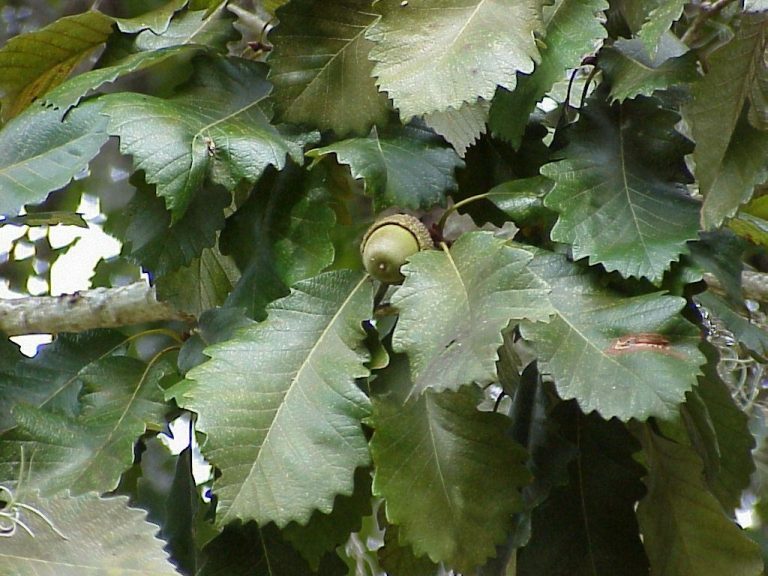 The white oak’s acorns mature in the fall of the year that they are formed and are preferred by wildlife because they are sweeter than the black acorn. 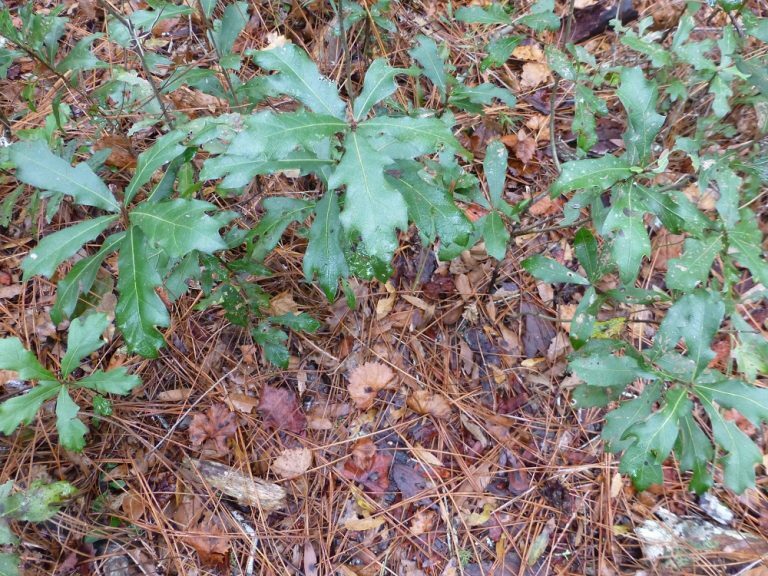 The black oak’s acorns mature the second year following their formation and tend to be much more bitter than the white’s. 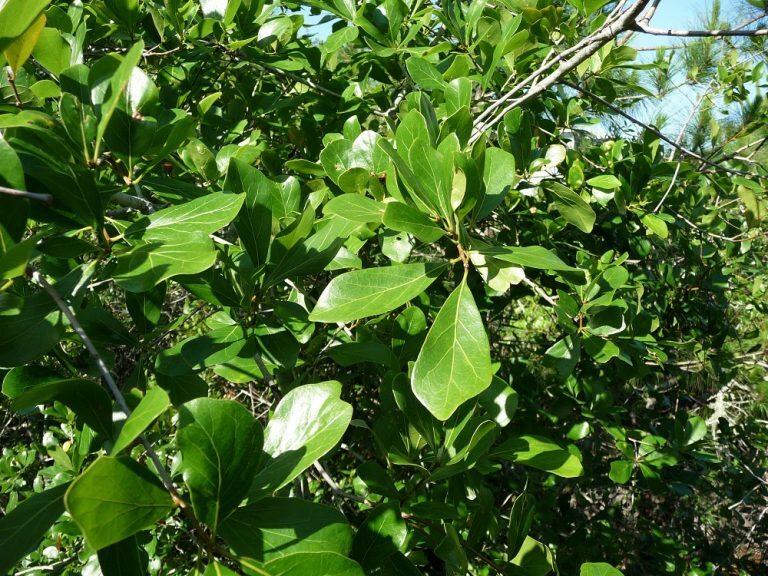 Habit: A small evergreen tree to about 24 feet in height. Leaves: Alternate, simple, thick, leathery & coarsely veined, ¾ – 4 ¾ in. long & ¼ to1 ½ in. wide. The margins are entire, and extremely revolute – turn the leaf upside down & it looks like an elongated bowl. The upper leaf surface is dark green, and the lower is dull gray. The petioles are densely pubescent. Flowers: Male flowers appear at the tips of the branches in 3 ¼ – 4 ¾ in. catkins. 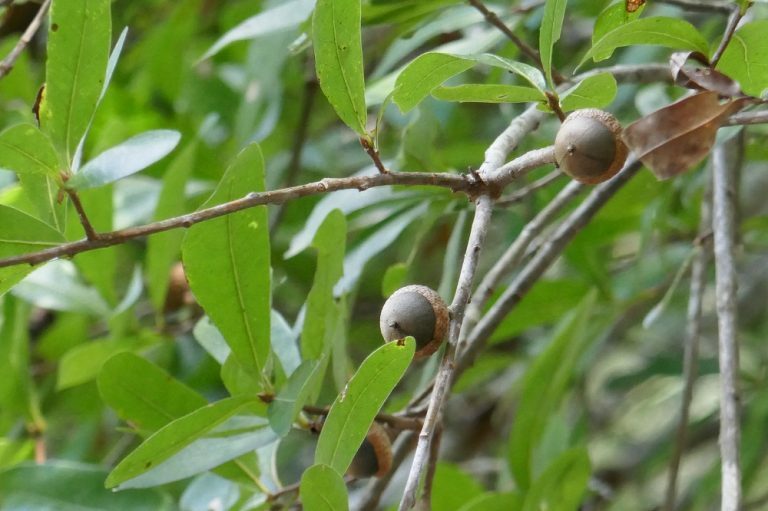 Habit: An evergreen tree to 30 feet in height. The bark is thick & roughly ridged. Habit: A small deciduous tree reaching 36 feet in height. The bark is dark gray to black, and deeply furrowed. Leaves: Alternate, simple, and elliptic to lanceolate. The margins are entire, 2 – 4 in. long & ½ – 1 in. wide. The upper leaf surface is bluish to ashy green, and the lower is silvery and tomentose. The apices are tipped with a short bristle. 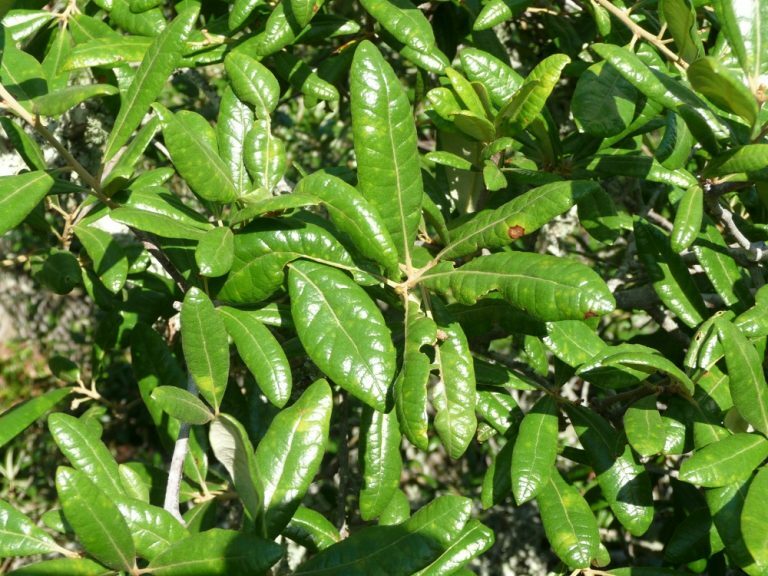 Habit: A small evergreen tree to about 8 feet in height. Leaves: Alternate, simple, elliptic, ¾ – 4 ¾ in. long and ½ – 3 in. wide. Margins are entire and strongly revolute. Lower leaf surface with a powdery yellow fuzz. Acorn: ½ in. long and in the black group. Habit: A deciduous tree reaching 45 feet in height. The bark is dark gray, blocky & furrowed. Leaves: Alternate, simple, 3 – 12 in. long & 1 – 8 in. wide, with three to seven deep lobes. The lower surface is hairy in the vein axils. Habit: A large deciduous tree to 90 feet in height. Dark grayish bark. Leaves: Alternate, simple, entire, 2 – 4 in. long & ½ – 1 in. wide, obovate to oblanceolate. Some leaves may appear diamond shaped. Habit: A deciduous tree reaching 30 feet in height at maturity. Leaves: Alternate, simple, ¾ – 6 in. long & up to 5 in. wide. Typically with 3 to 5 rounded or squarish lobes. Habit: A large deciduous tree reaching 100 feet in height. The bark is scaly. Leaves: Alternate, simple, obovate, 4 – 9 in. long & 2 ¾ – 6 in. wide. Margins with shallow lobes that appear undulate rather than lobed. 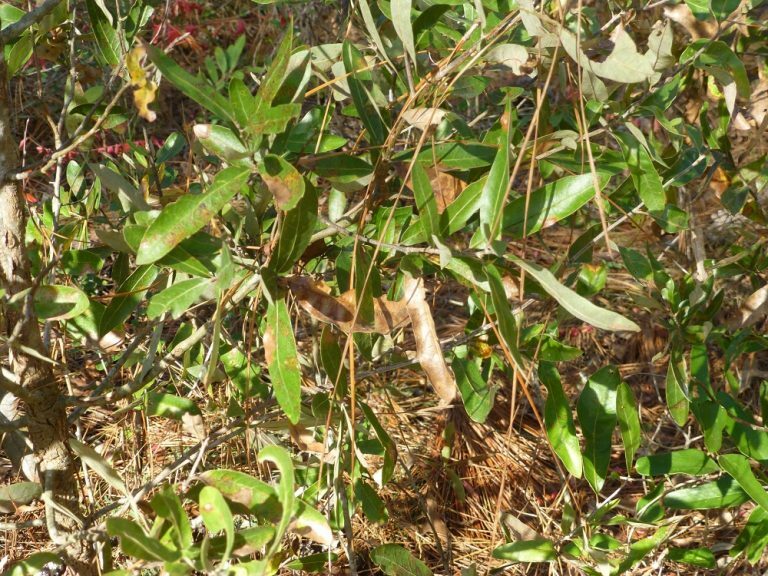 Habit: An evergreen shrub reaching 3 feet in height. Leaves: Alternate, simple, oblong to obovate, ¾ – 4 in. long, often toothed, less often entire. Lower leaf surface is finely pubescent. 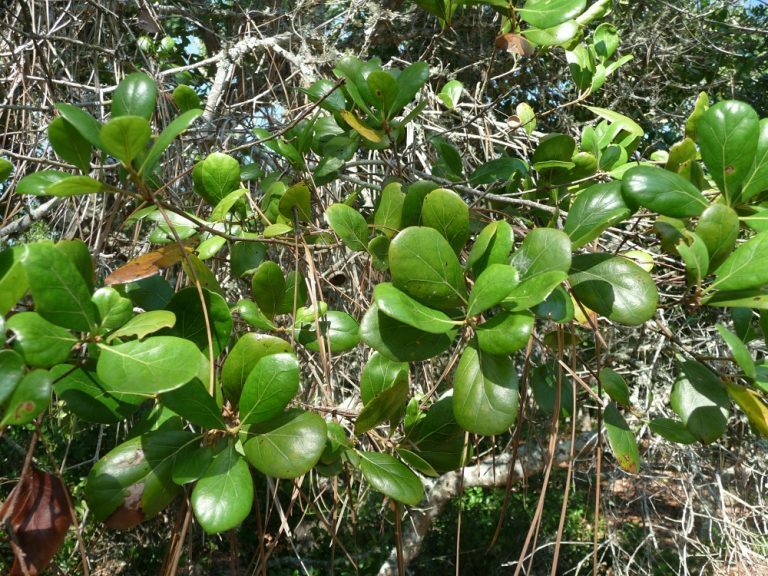 Habit: An evergreen tree to 25 feet in height. Leaves: Alternate, simple, may be elliptic, oblong, or oval, ¾ – 3 in. long & ½ – 2 in. wide. Margins entire or lobed, and revolute. Upper surfaces are dark green, and lower surfaces yellowish green. Habit: A deciduous tree to 75 feet in height. The bark is smooth to shallowly furrowed. Leaves: Alternate, simple, entire and variable in shape. 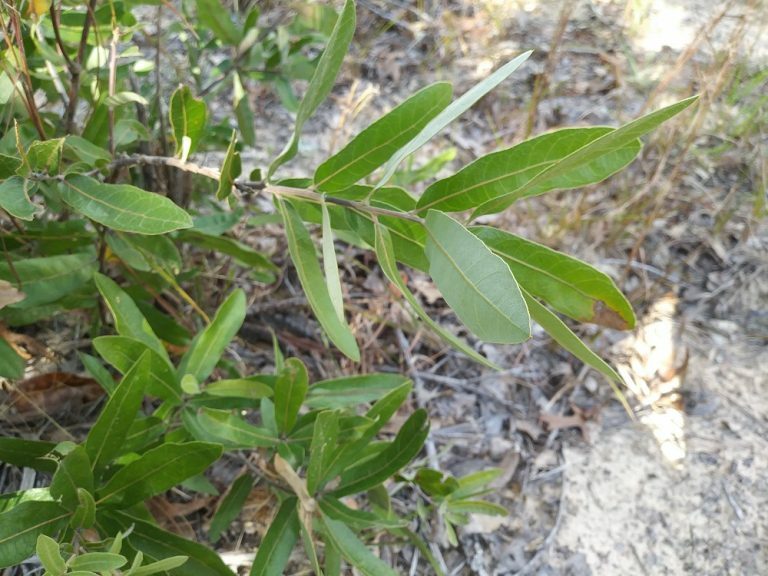 Leaves may be three lobed, but are more commonly spatulate, 2 – 4 in. long & 1 – 2 in. wide. 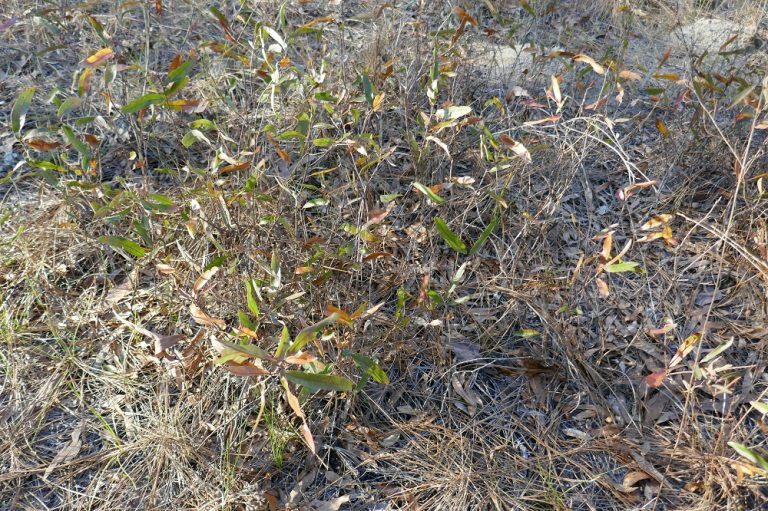 Habit: A semi-deciduous shrub, commonly forming thickets of subterranean runners, generally 3 feet tall. If the site has not been burned recently they may be 6 feet in height. Leaves: Alternate, simple, oblanceolate or spatulate, narrowly elliptic, or lanceolate, with entire margins. Habit: Large, spreading, evergreen tree to 60 feet in height. Rough bark with the short, central trunk dividing above the ground into several large branches. 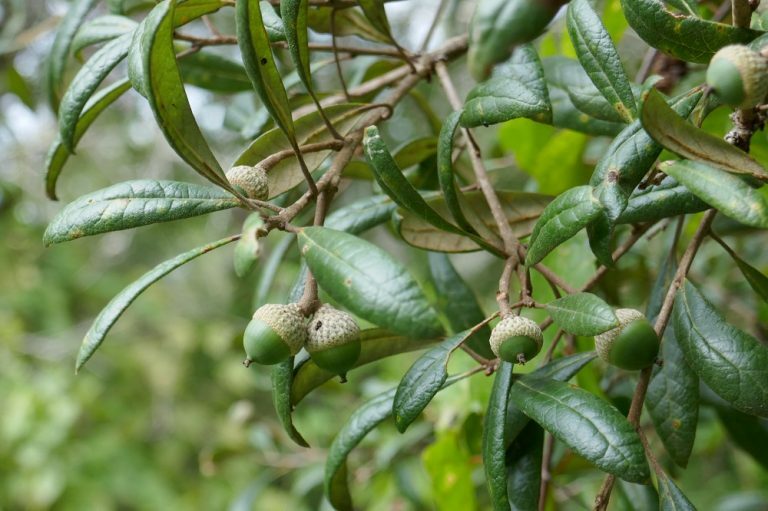 Leaves: Alternate, simple, entire, leathery, and stiff to2 – 5 in. long & ½ – 2 in. wide. Upper leaf surfaces are green & shiny above, and pale gray & sparsely tomentose below. Leaves of saplings and shoots may be toothed or shallowly lobed. Flowers: Male flowers are hanging catkins 2 – 3 in. long. alternate – an unpaired arrangement – as opposed to opposite. Alternate leaves are located singly on the stem. compound leaf – a leaf in which the blade is subdivided into two or more leaflets. The opposite is a simple leaf.